In Version 6.7 you now have the ability to set an expiration date on documents added to the extranet. 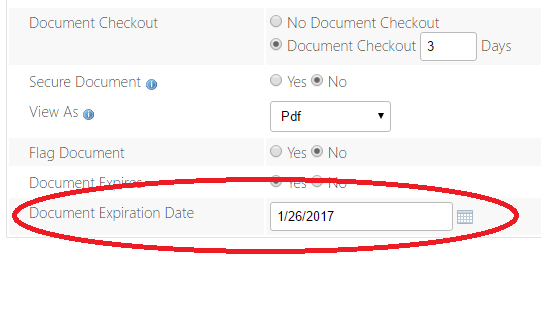 Three days prior to the expiration, the owner of the document will receive an email notification informing them that the document is coming up for expiration. When the expiration date is reached, the extranet will automatically delete the document from the system. Add or modify any document. Expand the Document Settings section and choose “Document Expires”. Enter or select an expiration date.